3. The Code Previously In the second blog post, I showed you how the demo web app works. In this final blog post, I will explain how this demo code was built by assembling the multiple ENS related libraries. [NOTE: The library API are evolving and it will more likely become out of date fairly quickly] 3. The code Before diving into the code, let me quickly explain various components which this demo code uses. ENS = The main smart contract repository which contains various smart contracts. DNSSEC Oracle = The smart contract that stores DNSSEC proofs. dnsproverjs = This library is in charge of extracting DNS information from DNS servers and storing the proof into the DNSSEC Oracle contract. You do not need to interact with this library directly as there is another wrapper library I will explain next. dnsregistrar = This project contains a special registrar smart contract that allows you to claim the ENS name based on the proof existing on DNSSEC Oracle as well a wrapper to the dnsprovejs library. The demo code is on my github . 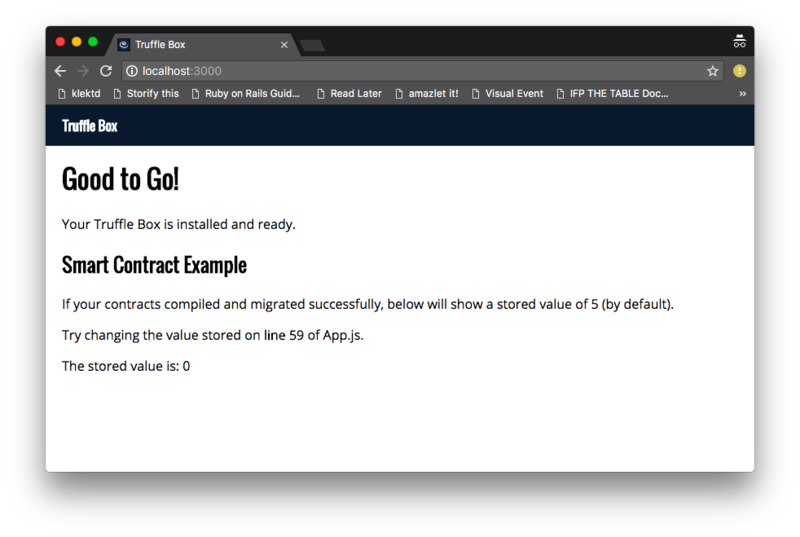 It’s quickly built on top of Truffle react box. and I will show you the process step by step. First thing first, you create react and unbox react components. If it’s successful, you should see the stored value of 5 on the page. When I first tried, it was just showing 0. It was because I was starting up ganache on port 8545, you need to edit getWeb3.js manually to change port number. I already explained the three libraries. eth-ens-namehash is used to hash your ENS name when looking up if your ENS entity exists. Deploy ENS and DNSSEC contract. Deploy DNSRegistrar with ENS address, DNSSEC address, and .xyz domain name. Set .xyz as a top level domain (TLD) of ENS contract. Set algorithm and digest to DNSSEC contract for verifying signature. Once the migration file is created, run truffle migrate . DNSRegistrarJS is a very thin wrapper of DNSRegistrar contract and dnsprovejs js libray. It requires your web3 provider and DNS registrar address (given that you run the migration, you can access the address via DNSRegistrar truffle function call. 4.2 call registrarjs.claim() This function looks up DNS server for the given domain name and returns an claim object with found attribute. if the domain name prefixed with _ens. contains a record, the found attribute returns true. 4.3 claim.submit() By calling the function, it will send two transactions, one to call DNSSEC#submitRRSets that submits the proof and another transaction to call DNSRegistrar#claim that sets ownership on ENS. 4.4 Bonus: claim.oracle.knownProof() to check if the oracle has the proof If you want to get more info about the detail of DNS record or proofs of DNSSEC Oracle, the claim object returns a few more attributes exposing the guts of dnsprovejs API . // Ask DNSSEC Oracle if the proof exists. Support for Ropsten network (once the new DNSSEC Oracle smart contract is deployed).